Induction of the new members of the church executive board in Düsseldorf. 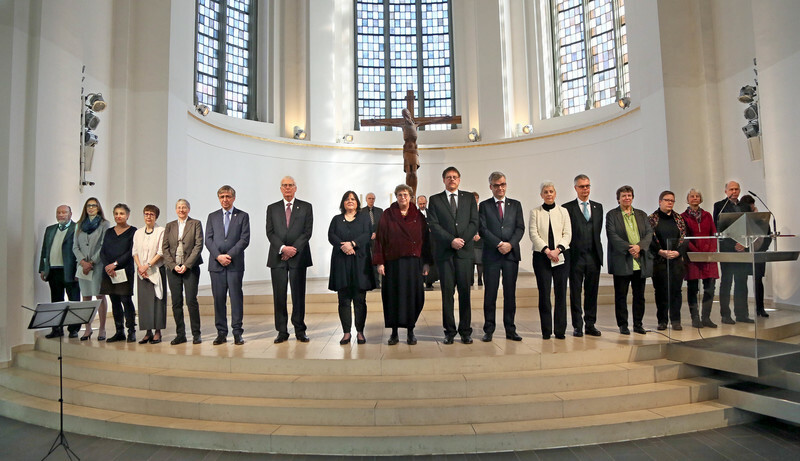 At a festive service of worship in the Johanniskirche in Düsseldorf, President Manfred Rekowski inducted into office those members of the executive board of the Rhineland Church who had been newly elected by the 2017 Regional Church Synod, along with those who had been elected for a further term of service. “Living out the grace of God and turning it into a living experience is the first and final duty of every Christian believer – and in particular that of our new Church leadership”, was the clear message from Oberkirchenrat Klaus Eberl, Director of the Department of Education and Training in the Regional Church Office. In his sermon on the biblical story of the expulsion of human beings from paradise, he looked at aspects of desire and failure and at the brokenness of the world with which humankind is confronted. The challenge facing the church – and therefore also the church leadership – was outlined by Theological Vice-President Christoph Pistorius: “It is nothing less than the question of how we can be relevant according to the will of God”, he said in his welcoming address, associating himself with the words of President Rekowski. Speaking as representative of the newly inducted members of the executive board Revd Pistorius continued: “In this way, sustaining our personal piety is a constant source of strength and a guideline for what we do in both our professional and our private lives, and not least for our service in the leadership of the Church”. On behalf of those who were being discharged from serving on the executive board, Dr Monika Lengelsen looked back over their time together and gave a reminder of how a spirit of sharing a common purpose had always prevailed even at times when differing positions were taken over a particular matter. Last but not least she remained certain that: “When we have reached the end, God is setting out on a new beginning”. Greetings were brought by OKR Marianne Wagner from the Evangelical Church of the Palatinate. She said that it was important for neighbouring churches to join forces for working in the world. There was already some good joint work being done between the Palatinate and Rhineland Churches, with the Ebenburg conference centre and teacher-training programmes as examples. There was also an ecumenical greeting from the Roman Catholic Diocese of Essen. President Rekowski read out a letter from Bishop Franz-Josef Overbeck, saying that during worship today in his own cathedral in Essen he would be praying for his brothers and sisters on the executive board of the Rhineland Church and for their service in the leadership of the church. Those inducted as full-time staff members were Vice-President Christoph Pistorius, (Mettmann), Oberkirchenrätin Barbara Rudolph (Düsseldorf) and Vice-President Dr. Johann Weusmann (Düsseldorf). 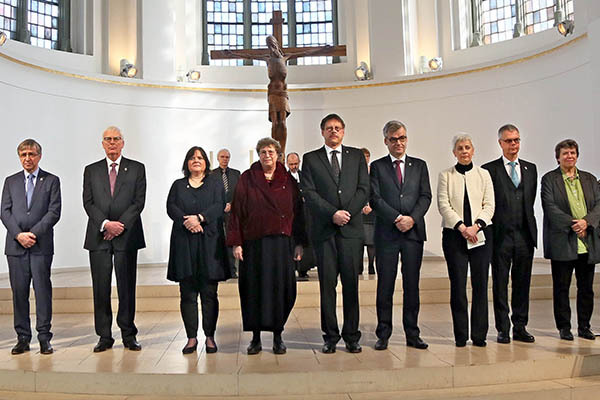 Those inducted as additional (non-staff) members were Revd Dr. Barbara Schwahn (Düsseldorf), Superintendent Andrea Aufderheide (Urbach), Dr. Axel Epe (Düsseldorf), Wolfgang Albers (Bonn), Hartmut Rahn (Solingen) and Marlis Bredehorst (Köln). Those inducted as deputy additional non-staff members were Revd Christiane Münker-Lütkehans (Moers), Revd Monika Kindsgrab (Essen), Revd Kirsten Arnswald (Becherbach), Revd Corinna Clasen (Meisenheim), Dr. Wolfgang Osterhage (Wachtberg), Gabriele Orbach (Köln), Renate Görler (Wuppertal), Dr. Elisabeth Fillmann (Idar-Oberstein) and Dr. Rainer Lemaire (Bergisch Gladbach). Those discharged from service as non-staff members were Helmut Schwerdtfeger (Sonsbeck), Eva Hoffmann von Zedlitz (Köln) and Dr. Monika Lengelsen (Düsseldorf); and as deputy non-staff members Revd Bettina Roth (Mülheim an der Ruhr), Superintendent (retired) Ute Kannemann (Gießen) and Sabine Fischer (Wuppertal).